Initially, as part of my food storage comparison, I had included Harvest Right. I asked them to send me some samples. They were more than happy to oblige and sent me a box full! With just a little bit of comparison I decided that I should not lump them together with the other long term food storage companies. Here is why. 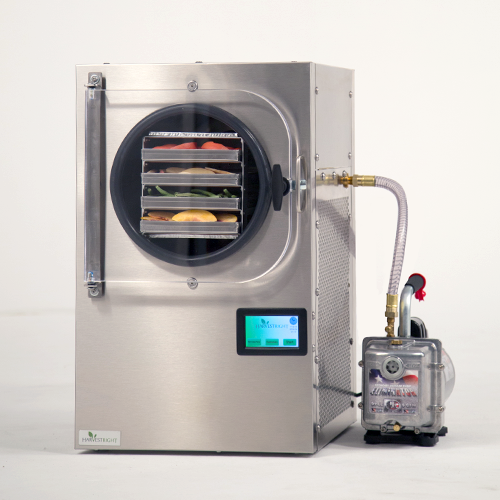 The Harvest Right freeze dryer allows you to freeze dry your favorite foods at home and then store them for up to 25 years when packaged correctly. I hope you caught my intentional wording there. Harvest Right sent me some freeze dried fruits and vegetables as well as a few entrees which they had prepared and freeze dried themselves. When we spoke they made it clear to me that they should not be compared along side other long term freeze dried foods. After tasting some of their foods and comparing them to some of the other major food storage brands it was easy to understand why. With this machine in your home you can preserve all of your favorite foods. There's no need to force yourself to eat that chili you bought as part of the bulk purchase of that brand name freeze dried food storage you really don't care for, but don't want to see go to waste. (As I mentioned in my long term food storage comparison I didn't like any of the chili I tried.) Make your own favorite secret family recipe, freeze dry it, and put it in a Mylar bag with an oxygen absorber and enjoy it several years in the future. Let me tell you a little about the food samples they sent me. 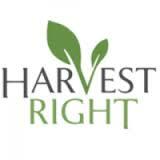 I do realize that they are Harvest Right's own recipes and that the taste of my own recipes would vary. Have you ever eaten a freeze dried purple grape or slice of pineapple. Wow! Better than candy! Did you know that you can freeze dry cheesecake, ice cream scoops and even Fat Boy ice cream sandwiches in their wrappers?! I didn't! The scalloped potatoes were amazing! Their Creamy Chicken with Wild Rice was fantastic! I imagine that they tasted just about a good as when they were made fresh. Comparing your own favorite recipes that have been freeze dried in the Harvest Right freeze drier to those of other long term food storage companies is actually not a fair comparison at all! Not even close! As part of my long term freeze dried food storage comparison that you can read about here: http://www.preparedguy.com/2016/06/confused-about-long-term-food-storage.html , I realized that there was no way that I could make my review about taste only. I couldn't make it about cook time, serving size/calories, or ease of preparation. There are way too many meals, way too many variations. Taking all of that into consideration, with a few exceptions, they were all the same. So, why would I waste more time trying to pick them each apart and identify their differences? Not gonna do it. The biggest problem that I found between all of the different food storage companies I tried, when it comes to 25+ year shelf life food, is: it all pretty much tastes the same. Like I said, there are a few exceptions but that doesn't mean that those exceptions are any better. To achieve such long shelf life the manufacturer must remove all fats and oils that could go rancid. This removes a lot of flavor. Some of the manufacturers meals I tried add extra spices and flavoring which honestly just makes the flavor stronger, not better. A better way to go about your long term food storage is to prepare it yourself. Yes, with the Harvest Right freeze drier you can make some of the foods you prepare last up to 25 years but I personally wouldn't count on everything you prepare to last last long. As I mentioned previously, over time, oils and fats will go rancid. Could they still be edible after 25 years? Many foods can and will. What about meats or other foods containing oils and/or fats? I guess that is possible but I wouldn't bet my life on it. My suggestion with the foods that you freeze dry is that you rotate them and eat them regularly. The freeze dry process preserves flavors so well you'll hardly notice that they have been on your cupboard shelves for years. This way you could keep the shelf life of the food and meals you have freeze dried to less than 7 years which will ensure great tasting food storage. Now imagine what you could do with the excess fruits and veggies from your garden, or even your Sunday dinner leftovers! These things aren't cheap, at all. But, if you're planning on buying a years worth of long term food storage for your family from one of those brand name companies, and if taste and quality is high on your list in importance, you should take a serious look at a Harvest Right freeze dryer. Once I have installed the new roof on our home that is overdue we'll be getting one. Priorities, right!? I have not received any compensation for my opinions, other than the most excellent samples Harvest Right sent me. Are you prepared to... walk?